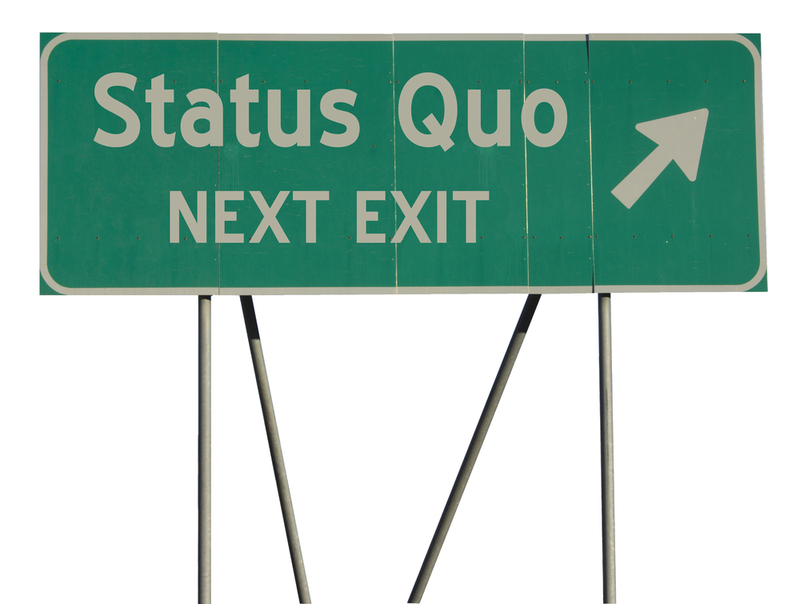 Where do you stand in the battle against the status quo? Within any organization, it’s undeniable that a degree of inertia exists that restricts your operation from running as efficiently as possible. If you are in a management or supervisory role, I’d wager there are some days you feel as though all you do is lean against this wall of resistance to keep it from toppling down upon you. Over time, this constant struggle against organizational and business process inertia simply becomes the status quo. The status quo is an interesting phenomenon. There is nothing inherently wrong with the status quo; it is after all, simply the current state of things. Yet, the status quo becomes an issue when it starts getting long in the tooth. Unlike fine wine and memories of your athletic prowess in high school, status quo does not necessarily get better with age. Status quo isn’t all bad. The guy has a few good qualities and he came to be out of the best of intentions. That being said, the status quo needs to be addressed, understood and deconstructed in order for organizations to drive their operations forward. At the end of the day, overcoming the status quo demands a team effort. In working with our clients, one of the most arduous tasks we face is breaking down and moving beyond the status quo. While technology is a big component of what we bring to the table for our clients, it is only a piece of the puzzle. Commonly, a larger part of what we do at SpryPoint is focused on how your personnel will interact with our technology and incorporate new business processes and procedures into your operation. At the end of the day, overcoming the status quo demands a team effort. Even the greatest technology in the world cannot transform your operation on it’s own. When it comes to redefining your status quo, a best practice is to engage your stakeholders. Whether your stakeholders are in the field or the management suite, each has unique perspectives and value to add to the process. Moving beyond the status quo is a difficult enough task on it’s own. Leverage experience both within and external to your organization to drive your operation forward.